The unkillable slasher killer is common sight in horror films after Halloween. The idea of a supernaturally charmed human monster has fueled countless nightmares. Somehow, the utter hopelessness behind the monster is never fully explored. Dust Devil is a poetic marriage of supernatural horror and slasher films. A living entity of evil, the “dust devil” of the title, haunts a broken and lonely woman in South Africa. The film lowers the body count and slows the story’s pacing to create more moodiness than menace. The gore is graphic, but used sparingly and effectively. The true cosmic scope of the dust devil’s terror is created with great sets, amazing lighting, and breath-taking cinematography. Director Richard Stanley even creates a terrifying climax in sunny, bright daylight. Some of the scenery, including an abandoned theater in the desert, is completely unique and unforgettable. The film is far from perfect. 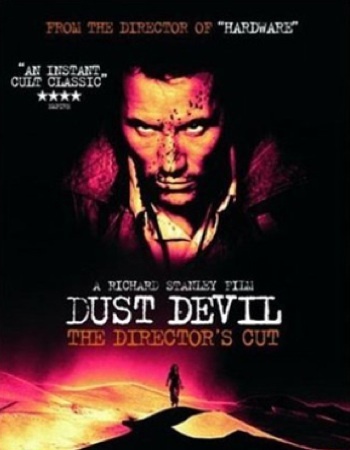 The performances from lead actors Robert John Burke and Chelsea Field are a little off (though Burke brings a tremendous physicality to his role as the dust devil). Also, the film has also aged poorly, with shots of a killer in a brown duster and close ups of boots walking down a highway straight out of a book of 90s clichés. The Internet Movie Database lists several different cuts of the film, so buyer beware. Dust Devil may be closer to a horror Western than to Jason Voorhees, but the unending evil of an unrelenting killer has never been bigger or more threatening. The final girl has never been so alone.